I have been searching through trying to find some good ideas and recipees for dog treats. Any one have any? I have no tried any of these but this site had a lot. If you're able to get The Honest Kitchen, and even if you can't, there are a lot of recipes on their site that do and don't use their foods. This is called fish fudge I seen it on dogster a few times. to cool, remove from pan and break into pre cut squares. I kinda did my own thing added some fresh cooked pumpkin in the mix a can of mackerel, can of salmon and two or three of sardines and since I added pumpkin I didn't add the water from the can.. Even if I didn't add the pumpkin I'd still have drained the water out.. I also added a bit of oats with it and used whole wheat flour. The dogs like them I got them cut into squares and in little baggies in the freezer so all I need to do is take one out of the freezer for training.. I cooked mine for a bit longer, but maybe it's due to the pumpkin added or my location or oven I dunno.. Smelled good to me. My mom has a recipe for for dog biscuits can either add peanut butter, cooked ground meat, or cooked liver to it dunno the recipe need to see where she put it. treats. Store in the refrigerator. For frosting peanutbutter and yogurt. I got some other recipe for treats need to read them and write it on my pc so I can post them easier.. I use cooked meat cut into bite size for training bit more messy, but for recall it's a good treat also dehydrated meat or organs is good treat heart or liver etc. 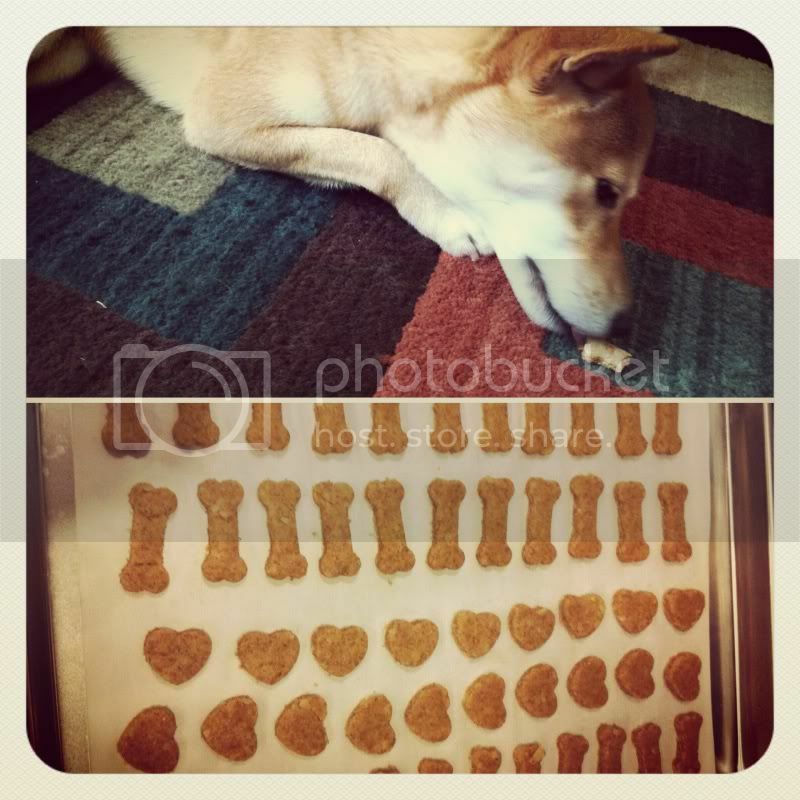 I'm going to try this one tomorrow: http://www.pauladeen.com/recipes/recipe_view/cheesy_dog_treats/ since Yuki loves cheese. I'll probably substitute all-purpose flour for whole wheat flour and leave the garlic salt out. I really enjoy making jerky...it's affordable and the dogs love them! Thanks everyone so much for the recipes. I can't wait to try them. Thanks Calia for the link. I was trying to find other discussions about treat recipes . I'll try them here over the holidays and see if they are also Tosh approved ! I am interested in getting a dyhdrating meat for Zach as a treat. Does anyone do this? I found one recipe where you do use chicken and the oven to make chicken jerky...has anyone else ever tried this? Here's the recipe my mom had it's from my grandmother. 1cup wheat flour, 1cup corn meal, 1 egg, 3TB oil, 2 1/2 parsley, 1/4 garlic, 2/3 chicken stock. Slowly mix in and add 1/2 cup cooked liver or peanut butter. Roll 1/2 inch thin and bake at 350 on greased cookie sheet 20minutes. The kind my mom made she used peanut butter natural kind and instead of corn meal she put oats in it and she didn't put parsley in it we didn't have any and again garlic is optional also be sure chicken stock doesn't have onion in it some of them do dunno if it hurt the dog, but rather not tempt it can always do this after boiling chicken for chicken salad or something.. Mom has made them with boneless chicken breast before she cooked it and then ground it up and mixed it in steak could probably be used I might try it with steak see how it turns out. Here's picture of the finished product it is soft enough I can make them into medium size treats or smaller treats if I want and so far not too messy I just put some in the treat bag and my hands don't feel too greasy or anything. I like taking large sweet potatoes and cutting them into slices about 1/4" thick and dehydrating them in the oven for 4 or 5 hours at about 200 degrees. I saw a packaged item at the store and thought it would be more cost effective and fun to do it myself. It was so easy! I made Zach the pb cookie recipe today. He loves them!!!! We made the cheese cookies and they were a big hit! 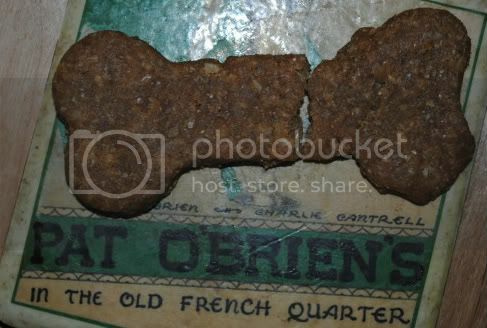 http://www.pauladeen.com/recipes/recipe_view/cheesy_dog_treats/. We substituted all-purpose flour for whole wheat flour and left the garlic salt out. I have a food dehydrator and Kimi loves the dried beaf heart and dried apples. I'm having a birthday party for Foxy this Sunday. Having her neighborhood doggie pals as well as two of my daughter's friends and their dogs over in the backyard. If I can manage to get one pic of all the dogs at the picnic table with hats on and Foxy in front of her cake I will be ecstatic. I was playing with ideas for cupcakes then decided to keep it simple and bake a meatloaf in a cake pan and frost it with peanut butter. We'll slice it after pics and each dog can get a piece. Question...how well would you cook a meatloaf for multiple dogs that aren't yours? What do you mean how well done? like well done you want your burger? Or something else? I'd cook it all the way most likely. Saya and Bella love hamburgers.